The use of cloud computing in a collaborative research setting provides both student and teacher a more ready means of written communication. Students are able to collaborate together more effectively by sharing written documents via Google Docs or Dropbox. It also allows the instructor an inside look at how students function collaboratively, providing them with the opportunity to comment on students’ research projects during the completion process. Cloud computing involves connecting two or more computers through the internet using a shared digital space. This type of collaboration diminishes the need for things like flash drives and allows students to transfer documents, images, or videos easily between workstations. Google Docs is an excellent example of an open source file sharing system that can be used in cloud computing settings. Google Docs allows you to create a number of different types of documents and customize public or private access to the document. Dropbox software also offers a simple method of sharing documents via the cloud. Dropbox is a file depository that allows you to customize access to your folders. You can make them viewable publicly online, allow select users access, or keep them private completely. The major difference between these two types of software is functionality. Google Docs has what is essentially an open source, or free, version of the Microsoft Office Suite in addition to acting as a digital repository. Dropbox, on the other hand, does not have any of this added functionality. 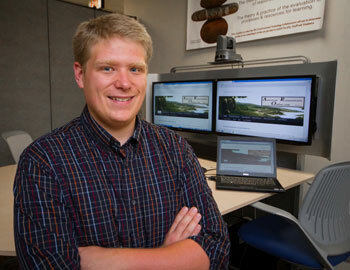 What Does Cloud Computing Add to the Research Process for Students? Cloud computing offers students a very quick and easy way to collaborate with one another, whether it be in K-12 public schools or in a higher education setting. Before this technology, students would have to coordinate this elaborate process to transfer all of the different files into one central document or PowerPoint slide. Google Docs, on the other hand, allows students to simultaneously edit the same document via the internet. This makes it much easier for students to plan and correct their projects as they are being created. Since all of the students’ work is stored in the same location and visible to all team members, all team members can check the progress on other portions of the assignment and act as checks against students who may be falling behind or missing the mark with their work. In addition, this seamless integration of word processing software and digital storage allows the entire creation process to be more productive since it has eliminated the need for the inevitable transfer and reformatting of separate files into the master file. What Does Cloud Computing Add to the Research Process for Teachers? Cloud computing offers two paramount benefits to the educators. First, it gives the teacher a direct line of communication to student groups, in addition to having complete access to all of the students’ in-progress materials. Second, it allows the teacher to peek into the collective minds of students as they collaborate. You can ascertain with a degree of certainty how they break up tasks between the members, and even how they decide to chunk or break up the concepts themselves. Providing student feedback is an important part of teaching writing and research , but by the time students have submitted their final project there is little time to change what are considered to be the deficiencies. Imagine being able to intervene if you notice that a student has taken a wrong turn somewhere before it is too late. This allows for a richer and fuller research process for the student, and allows both student and teacher the ability to meaningfully communicate throughout the research process. In addition to being able to provide prompt feedback to students and formatively assess their progress towards research goals, this type of learning environment also provides some interesting perspectives pedagogically. How do students respond when given a research question? What are their typical behaviors? Some groups will choose to break the entire task into subsequent parts, with each group member acting as researcher, writer, and editor for her own section. Other groups will choose to build on what are perceived as individual strengths and break a group of 5 into 2 researchers, 2 writers, and an editor who complies and adds continuity to completed documents. The possibilities are endless, and by giving students the ability to choose the formation of their groups, we are teaching them how to function collaboratively.Using this same principle, we are also able to monitor student participation, which provides evidence for what students may write in their peer evaluations of one another.